Want to thoroughly irritate a redneck or two? Creep up and pass ’em on the freeway in a Hyundai Sonata Hybrid, with California plates — and relish the fact that you’re getting 44 mpg in the process. That was the joyous fun I had last weekend on a road trip to Santa Fe, N.M. — happily nobody ran me off the road or took shots at me in retaliation — and I can very positively report that the Sonata’s gas/electric variation has been reborn as a stylish and almost-impossible-to-notice-that-it’s-a-hybrid-running machine. This was not exactly the case when the Sonata Hybrid first appeared. 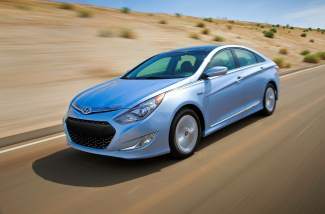 The Koreans went a slightly different route than their Japanese counterparts and while the first generation Sonata was notable for its low-weight, space-saving lithium polymer battery and an Atkinson cycle variation that allowed the car to cruise at freeway speeds in all-electric mode — the car drove poorly, halting and jerking and dragging as it shifted between gasoline and electric power. That’s all been cleared up for 2013, and the transitions are buttery smooth and, frankly, hard to notice (except if you’re cruising on a very hot day and need a lot of AC, which does lead to noisier start-ups and more engine use). Few carmakers today would boast about putting a less powerful engine in their new vehicle, but the 2013 setup’s 2.4-liter four-cylinder engine indeed has a little less boost than the old one. Instead, Hyundai considerably upped the electric motor and battery pack output — total combined horsepower is 199 — which results in smooth, fast starts, ample highway passing ability (sorry, Pueblo-area rednecks) and improved fuel efficiency. Over the course of a 700-mile journey, much of it at 75 mph or more in the strong winds typical to that blessed Las Vegas to Raton corridor, I got at least 44 mpg. I made it all the way there on half a tank of gas, for goodness’ sakes. What’s more, the Sonata Hybrid isn’t a pint-sized machine with weird angles and that in-your-face hybrid styling; It’s a full-sized, five-passenger sedan with small but decent trunk room and ample rear seat space. To differentiate the hybrid model, Hyundai has swapped in a black, Veloster-styled grille and some LED daytime running lamps around the headlamps; rear brakelamps are also a little more bold, and the car’s rear is indeed a little more wide and tall to emphasize aerodynamics. There’s also unique 16- and 17-inch, propeller-inspired alloy wheels. Otherwise, with the exception of a suite of none-too-subtle Blue Drive emblems all over the car, it’s pretty much standard Sonata – perfect for those looking for a larger and more comfortable but still affordable hybrid automotive option. All that extra yardage, especially the long nose, did mean I had to fight a bit in the worst of the crosswinds, but the car’s general character is smooth and quiet and its ride rather pleasant. Despite shedding some pounds, the battery setup in the trunk is still pretty awkward — you might be able to shove a couple of lacrosse sticks through the pass-through gate into the rear seat, but the dimensions are tight (12.1 cubic feet), even with 25 percent extra room than before. Taller drivers may find the Sonata Hybrid’s standard seating position a little high, but for the most part the comfort level is pretty good — I wouldn’t have minded ventilated seating, however. Interior design is in keeping with the standard Sonata, and the Limited model I drove was outfitted with a good touchscreen navigation system (none of the map problems I recently found in the Santa Fe/Sorento). The voice activation features were also pretty intuitive. As an added value proposition — and some extra peace of mind — Hyundai also offers lifetime battery replacement as one of the Sonata Hybrid’s selling points. That may not be such a bad idea, if you plan on keeping the car for many years.